Translation of a Hindi speech by Smt Indira Gandhi at a meeting to welcome the relics of Netaji Subhas Chandra Bose, Delhi, December 17, 1967. Many of us assembled here today knew Netaji well, and on this occasion we are overwhelmed by the memory of one who gave us the slogan Dilli Chalo. He is not with us. But his sword—which we have the privilege to receive here today—reminds us of his powerful and beautiful presence. Netaji was truly a symbol of India’s bravery.I still remember how thrilled we used to get as children by just looking into his fiery eyes. It was this fire, this patriotic fervour in him that led him to create the Indian National Army which brought many brave fighters for freedom, men and women alike, together, and which gave, a new impetus to our struggle for independence. The struggle for India’s independence was a long struggle; it was sustained by the sacrifices of millions of Indians. Among those who sacrificed their all in this struggle, the name of Netaji Subhas Chandra Bose takes a high place. He will always retain a place of affection and honour in every Indian heart. 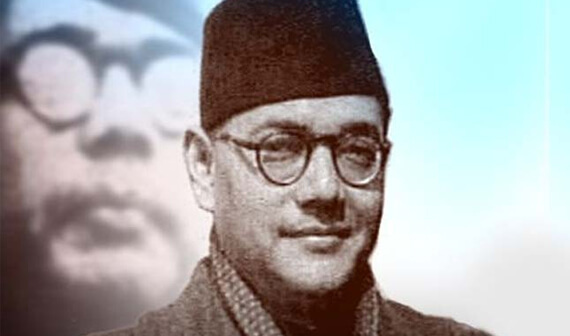 Netaji’s entry into political life gave a new turn to India’s struggle. A new wave of enthusiasm swept the country. His restless and dyna­mic spirit led him to a path that was somewhat different from our own. Gandhiji used to say that the only wrong path is the path of cowardice. The path of courage can never be wrong. Netaji’s was a path of courage, and it did bring the goal of independence nearer. Bankim Chandra gave us Bande Mataram, which became the marching song of the freedom struggle. On becoming free, we adopt­ed Rabindranath Tagore’s Jana Gana Mana as the national anthem. But today our biggest national slogan is Jai Hind. This slogan can be heard from NEFA, Nagaland and Kashmir in the north right down to the deep south. This slogan was given to us by Netaji. It reminds us of him, and also of the ideals which he placed before us. The President and the Vice-President, in their addresses, referred to the need for national unity. Equally important is the need in every Indian heart of an intense love of the country. This was the love that inspired Netaji. This sword here is as much a symbol of Netaji’s courage as of his intense love for his country. This intensity, this passion and fire, is something lacking in us today. We fritter away our passion in petty disputes and in the pursuit of narrow personal or group gains. We do not put this passion into the service of the nation. If we do this, we will have the courage to face every difficulty. Netaji had this courage. He was ever prepared for sacrifice. This courage, this spirit of sacrifice, is his message. We need this message in our struggle to give economic and social content to our freedom. This struggle is with us. To carry on this struggle we have to cultivate in us the courage, the fire, the passion of which Netaji’s sword is a perfect symbol.